There are some traditional frugal activities that will save money, if all of the circumstances are right, such as canning a bounty produce. However, this venture requires a few things, in order for it to be indeed frugal, like having the canning equipment and a source of cheap or free fruits or vegetables. Most autumns I have a free source of apples, my own backyard. This year was a poor year for our garden and fruit trees. The weather just did not cooperate. I have only a handful of apples this year. That means that if I want applesauce I either have to buy apples to make it, or buy ready-made applesauce. The last couple of weeks I have been craving applesauce, so I thought I would buy some apples and make my own. But I needed to do a price comparison between making my own and buying ready-made. Best price on fresh apples this week is 88 cents/lb, in my area. Although the peels and cores are waste, that cost if offset by water that is added to commercial applesauce. So, I figure those as a wash in costing this out. My estimated price per pint is 88 cents, for homemade applesauce, right now, not factoring in fuel to run the stove. At Fred Meyer I can buy the store brand of unsweetened applesauce at 10% off on Senior Discount Day (yesterday for this month). The regular price is $2.19 for 46 ounces. My cost after discount was $2. I found a digital coupon to load to my loyalty card, bringing the cost down to $1.70. That works out to 59 cents per pint. Buying the ready-made applesauce was the money saver, this time. I went ahead and bought applesauce, instead of doing the traditionally frugal thing of making my own. How about you? Have you ever found that DIY didn't save money after all? I recognize that there can be other factors to consider in one of these equations, such as flavor, or organic vs. not organic. This time around, I was satisfied with the product I would have if buying the ready-made product. And now I have an idea of the price per pound that I need to find on fresh apples, to make applesauce for less than store-bought. The bonus is that I freed up valuable time to do other frugal or income-producing activities during my work hours. You are correct in that, sadly, it is cheaper to buy the product than to can it or make it yourself. Like applesauce. Apples are rather expensive so making applesauce is also too expensive. Buying it is cheaper. We don't want high fructose corn syrup in our so that means reading labels carefully. Preserving a lot of other foods in the form of canning also can be expensive and with no garden, I probably won't buy food just to can them. I'm rather surprised at the high prices at vegetable markets and grocery stores. They often are still quite high. Thankfully, I have dad who has given me so much to fill my freezer at no cost to me. Oh, definitely on the corn syrup. 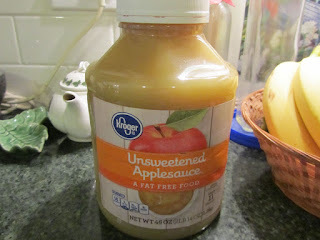 There was another variety of the store-brand applesauce that had 2 more ounces in the jar for the same total price. I was thinking, what a deal. Then I read the label and saw it had corn syrup, so I went with the pure, unsweetened applesauce. It's not easy finding a source of cheap or free produce any more, when I want it. I will sometimes come across a real deal that is limited in availability, but can't be predicted or planned for. Most years, my garden does well, and I have lots of apples on my own trees. That's so wonderful that your dad can grow a garden of abundance. I'm guessing that he continues with it, in part, as a way to help you and your family, out of love for you. I will probably do the same with my own garden when my kids are starting families. Have a great day, Alice! And, BTW, belated happy anniversary to you and your hubby!!!!! You're right. You have to do the math to know what the true costs of things are for comparison. And for me, equally important is the time factor. Is making something worth the time I would have to spend on it or is spending a little more and having more time the better thing? But that only works if you have the luxury of having excess in you budget. Many factors involved that each person has to determine on their own. Sounds like you made a good decision for you on the applesauce. I think when most of us were just starting our families, saving money was more of a priority over having extra leisure time. I agree that in different seasons of our life that having more leisure time becomes a priority. (YOLO) But also, if the money savings is not great, spending a little extra money, can free up time that can save even more money. For instance, not doing something like canning, to free up several hours in a week to insurance shop, competitively, and save $100s. With this applesauce, I think I made the right call. I saved money and time, and my kids were super glad that I bought this, as was I (comfort food, sort of thing). Have a wonderful day, live and learn. So true! Jam and jelly making especially, can be so expensive if one is not using free berries. In my area, I find that even berries on sale make the price of jam and jelly making much higher than buying store bought. This year was a horrible year for our fruit as well. We had some abnormally warm weather early in Spring, followed by some hard freezes. We have four apple trees and one pear tree, and didn't get one piece of fruit. It's disappointing. I was looking forward to making apple butter, applesauce and pear butter. Oh well, hopefully next year will be better. I'm so sorry that your fruit trees did so poorly, too! It was weather for ours, as well. We had cold weather long into spring, after a brief warming earlier. And now my veggie garden suffered due to prolonged heat and no rainfall. I bet our orchards and gardens will do better next year! Does your pear tree normally produce fruit well? I was under the assumption that pears needed a rooster tree. Do you have another pear tree close by in the neighborhood? Or is this one of those multi-cultivar trees with graftings of several varieties on one rootstock? I hope your day is a great one, Angie! On my pear tree, I'm assuming the latter, since there is no other pear tree on our 3 1/2 acres. We don't have any information on the fruit trees, they were already mature when we bought the property in September 2012. The trees didn't seem to be cared for at all by the previous owners. We noticed right away that they seemed to be in a pattern of bearing every other year. When they did bear, the trees were so heavy with fruit that we had branches breaking. My husband trimmed the trees last year to try and help the situation. This Spring, all of the trees were full of blooms, and then the hard freezes. To answer your other question though, the couple of years that the pear tree has produced fruit, we had more pears than we knew what to do with. Which is when I made pear butter, and my husband decided he likes it better than apple butter. I'll be anxious to see how your fruit trees do next year. I hope we both have lots of fruit! Your maths and situation make total sense. In years past, I was able to get organic apples for free, and put up/home canned multiple quarts (a case of which was unearthed in my recent move-I though it was tomatoes). That said, I will probably still put some up. Like another reader posted, we avoid HFCS, and the flavor is superior in a home canned product. I will go to the local orchard and get "utility apples" aka their seconds for much less than paying outright. I am also known to search the produce marked down trays for apples and make a quick, smaller batch of apple sauce. Yes, the corn syrup is something we avoid, too. Oh, that's wonderful that you have been able to obtain free apples. That may still happen for me, later this fall, maybe (fingers crossed). Flavor can be much better, depending on the apple variety. In recent years, a friend of mine has gotten a couple of bags of free apples from a friend, which are fairly flavorless, but we've improved them for applesauce with lemon juice and cinnamon. When my kids were young, their grandparents lived over the mountains from us (about a 5 our drive). When we went there in the fall, we visited an apple orchard and picked apples for a decent price. We brought home 2 cases of freshly picked apples, one year. My daughters and I want to go to a u-pick corn farm in another week. I'll be looking around for fresh, local fruit out in the farming areas, then. There's one other consideration on canning, too -- the can vs. a glass jar. I know some people don't want to eat an acidic food that was stored in a can. I think tomatoes that are home-canned in glass jars could be superior for that reason, alone, depending on the person's preferences. This is such a good point. I have also noticed this over the decades about sewing. When I was a kid, it was much cheaper to sew your own clothing. Now, unless you get a great deal on the yardage, you can find clothing a LOT cheaper, ready-made. As you said for food, it's not always "better" or even equal in quality/style/etc., but if you're trying to be frugal, sometimes home-made isn't the best deal on everything. oh, yes, on fabric for sewing most clothing. The one type of clothing that you can save a bundle on, by sewing your own, is formal wear, if you want new or you want coordinating/matching attire for an ensemble, like weddings. I did sew my own wedding gown and saved a fortune, for what I wanted. A great source for fabric on the cheap is previously-owned clothing. This worked great for when I was sewing for my kids. I could take a hand-me-down dress or thrift shop find and use it for fabric to sew a dress for a daughter. I made shorts for my son, when he was a toddler and pre-schooler, out of hand-me-down men's shirts. And I have bought clothing at the thrift store and garage sales to use for the fabric in home decor crafts. I also sometimes find fabric in thrift stores or garage sales, at a good price, but of course, there isn't much selection. Good point on sewing no longer being automatically frugal. I'm not sure I would have the patience to do the math. :) Like Live And Learn, my time is a huge factor--in my case, if I work another day in a week, I come out much farther ahead than if I make homemade versus purchase store-bought, so I often choose to do the "fairly cheap" thing (buy the store brand) versus the DIY thing. One of my factors, though, is taste ... I love me some homemade applesauce in the fall. As you know, my husband is the produce person in our family. What he can't grow in the garden, he tries to get at the farm market. He has gone enough and gotten to know enough vendors to know who is likely to have seconds, and the price difference can be substantial. It requires the willingness to chat up the different vendors--something he is more likely to do than I am. Oh, yes, sometimes the time savings can translate to higher income, or more savings in another area. That is so awesome that your husband has made contacts in the farming community. I don't know if that could be "me" but it is something to think about. You have a gem of a husband, and I know that you know that! Yes, homemade laundry detergent did not work at all for us and I've tried 3 different recipes. Stained clothes are not cheaper than just buying detergent that works. Yes, ruined clothing is not cheaper than just buying commercial laundry detergent! There are ways to buy detergent for less. I think finding what works best, without waste (of time or money) is what matters. Commercial laundry detergent does work better for us, too. However, I do use melted bar soap for laundry whenever I am in-between the commercial stuff, to tide us over until I can get back to Cash & Carry to buy a big bucket. The recipes for making a laundry soap powder never dissolved in our water, here. Our incoming water is very cold, even in summer, and I wash on the cold setting most of the time. I agree with you Rhonda. I tired but it does not work at all with our super hard water. It is cheaper in the long run to just buy detergent and have clean non-dingy clothes. I hate applesauce, but TheHub loves it occasionally. I find for us it is smarter to buy the individual cups of applesauce. They have a long shelf life, he eats one every now and then and we have no waste. It sounds like you've found the right amount of applesauce to buy, then. Have a great day!